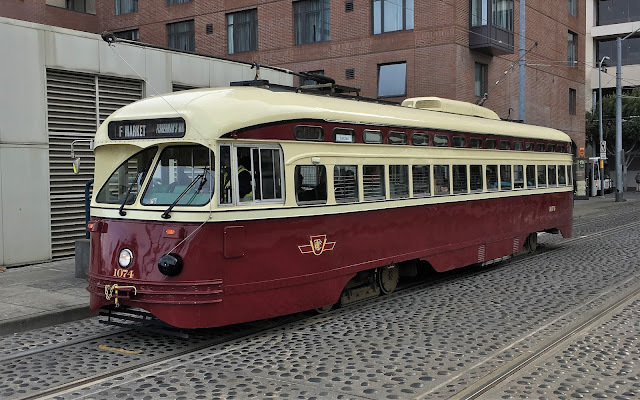 San Francisco today runs historic street cars from many cities, like this one from Toronto. Some notable people, in life, get to write an autobiography. Maya Angelou wrote seven autobiographies. The trailblazing poet who was reverentially called "the black woman's poet laureate" was also a trailblazer outside of arts and letters — Maya Angelou was the first black streetcar conductor in San Francisco in 1943. At age 15. The then Marguerite Annie Johnson walked into the offices of the Market Street Railway Company and asked for an application to become a streetcar conductor. She left empty handed as the staff would not give her the application based solely on her color. When Marguerite returned home and told her mother the story her mother told her to go back to the railway company until they gave her an application. Marguerite arrived at the offices the next day before they opened, before the staff arrived. She sat in the waiting room until the reception staff left for lunch. At that time Marguerite would go out for lunch and return before the office staff returned from their lunch. She would stay through to the end of the day. She did this every day for two weeks, enduring the racial taunts of the office staff steadfast in her desire to become a streetcar conductor. After two weeks, she was approached by one of the managers in the office who asked, "Why do you want to become a streetcar conductor?" Marguerite replied that she liked the uniforms. In retelling the story years later Maya stated that the reason she kept returning every day was because her mother had told her to return. Her mother, mindful of her daughter's safety drove her to work every day before dawn (with her pistol on the seat beside her) and followed her streetcar until daybreak before heading home. Maya held the job until the end of summer to return and finish her final year of high school. Maya Angelou had a dream and in fulfilling that dream she became a trailblazer in the process. Even if she had to lie on her application and say she was 18.